Antonia Wright, Under the Water was sand then rocks miles of rocks then fire, 2016, still. SAN FRANCISCO - In California and around the world, the sun is the source of both life and destruction, and it is also a central subject of two new exhibitions at the San Francisco Arts Commission (SFAC) Galleries this fall. The SFAC Galleries presents 10,000 Fahrenheit and Young Suh: Wildfires at the Main Gallery in the historic Veterans Building. The exhibitions feature photography and video about climate change, fragility and the passage of time by artists from the Bay Area, Miami, Chicago, New York and Montreal. 10,000 Fahrenheit and Young Suh: Wildfires are affiliate events of the Global Action Climate Summit taking place September 12-14 in San Francisco. The exhibitions also coincide with the World Cities Culture Forum in November, which will include discussions about culture and climate change. In 1995, renowned Bay Area photographer Linda Connor gained rare access to images of solar eclipses from 1889 – 1918 recorded on glass negatives housed in the archives of the Lick Observatory, located on the summit of Mount Hamilton just east of San Jose. Connor spent the next fifteen years creating sun-exposed contact prints utilizing the fragile, often broken plates, and the resulting images compress time, and reinforce a fascination with documenting celestial events dangerous to witness with the naked eye. Over the course of four months, and then a year, every time husband and wife artist team Sarah and Joseph Belknap thought of the sun, they went to NASA’s web site and recorded an image of the sun’s spots. The resulting composite images reflect a diary of the passage of time – fleeting, personal, nonregimental human thoughts documented by solar markings. This small gesture connects humanity with the movement of the cosmos. 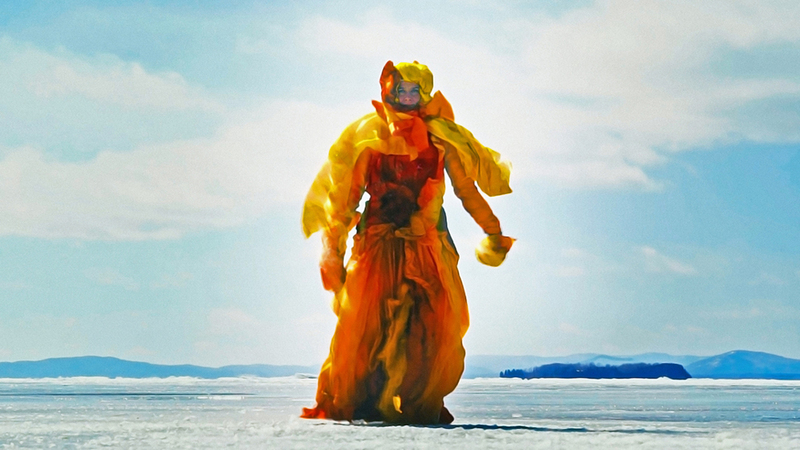 In the video, Under the water was sand, then rocks, miles of rocks, then fire, Miami-based artist Antonia Wright, walks across a frozen expanse of water in a suit resembling flames. We hear the creak of the ice, and just as she reaches the front of the frame, the ice cracks and she sinks below the surface, never breaking eye contact with the camera. The anxiety and anticipation of what might, and eventually does happen, brings the viewer into the artist’s emotional sphere as she creates a childhood event. The fire and cracking ice also serves to provide literal perspective on the role humans play in the global warming crisis. On any given day, conditions on the sun modify the transmission of radio waves. In his video 31 soleils (Dawn Chorus), Montreal-based artist Jean-Pierre Aubé developed equipment to record rumbling static and random, scrambled, low frequency radio clips and combined the audio score with an imposing telescopic video of the rising sun, emphasizing the unseen chaos of personal expression projected into space. Bay Area’s Lisa K. Blatt’s large-scale, neon-hued photographs were taken on-site at two extreme locations that are ground zero sites for measuring climate change, one of the clearest lakes in the world in Chile and at a live volcano in Antarctica. These “heatscapes” push landscape photography into a realm that bridges abstraction with personal, social and environmental narratives. Bay Area-based artist Chris McCaw and Brooklyn-based artist William Lamson both employ the sun to literally mark the passage of time. For the exhibited work, McCaw retrofit a 1913 rotating panoramic Cirkut camera to assist him in an endurance project recording the sun’s path for up to 80 hours in the Arctic Circle where at certain times of year, the sun never sets. The sun burned its rise and descent onto a scroll of vintage silver-based paper inside the carefully tended camera, creating a one of a kind document. Lamson took a cart outfitted with a large lens to the Mojave Desert, and burned a 352 ft. black arc into the dry mud reflecting the path of the sun from dawn until the last traces of light left in the sky. This is the first time Bay Area painter Chris Duncan has been included in a photo-based exhibition. Although he considers his work paintings, the process is similar to early cameraless photographic printing methods. Duncan wraps colored fabric around windows and skylights and lets the sun do its work for up to six months, ultimately revealing a central fade and gentle fold-marks the artist harkens to the rendering of folds of fabric in Renaissance paintings. Adjacent to 10,000 Fahrenheit, will be a selection of images from Bay Area photographer Young Suh’s four-year project Wildfires. Far from documentary shots, Suh creates lush and languid images that pull back miles from the fire, and then take the viewer within feet of the source. He’s fully aware of the romantic nature of smoke and haze. “Modeled after the 19th century American painters such as Bierstadt and Gifford, the picturesque sunset is enhanced by the haze of the smoke from a nearby fire. Like honeybees that are numbed by smoke before harvesting of honey, fire burns through the history of the representation of nature and tranquilizes our senses,” says Suh. This expansive series was shot on the fringes of some of Northern California’s most devastating wildfires. Suh also embedded with firefighters during controlled burn exercises, allowing for safe, close access. The San Francisco Arts Commission Galleries is a program of the San Francisco Arts Commission, the city agency that champions the arts as essential to daily life by investing in a vibrant arts community, enlivening the urban environment and shaping innovative cultural policy.